Have you got the "hots" for hot peppers? 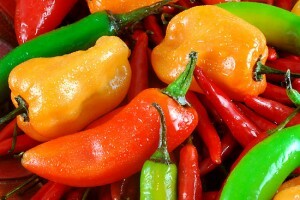 Home > Healthy Cooking & Eating >Have You Got the “Hots” for Hot Peppers? Have You Got the “Hots” for Hot Peppers? Cinco de Mayo (May 5) is just a couple of weeks away. It’s a festive day when people enjoy spicy Mexican food. To get that kick in Mexican food, hot peppers are used. The heat in “hot” peppers is from a chemical compound called capsaicin. It causes a mild burning sensation in the mouth and throat. How often have you reached for a glass of water to “cool” your mouth down with no success? That’s because capsaicin is a fat soluble compound, not water-soluble. You need to drink or eat something that will attract the capsaicin and bind it. Once bound, it can’t continue the burning sensation. For relief, scientists suggest milk. Milk contains the protein, casein, which is a lipophilic or fat-loving compound. It binds to the capsaicin, inactivating its burning properties. While casein may be fat-loving and therefore attracted to the capsaicin, it’s the protein component of casein that does the trick. So even skim or low-fat milk works just fine. Are Hot Peppers Good For You? From the plants point-of-view, capsaicin is a valuable chemical to contain acting as a deterrent against certain mammals and fungi. While the seeds within chili peppers do not produce any capsaicin, the white pith of the inner wall where the seeds are attached contain a large amount of capsaicin. That’s why seeding and removing this pith will tame the beast a bit. But make sure you wear gloves as you do it because it’s too easy to work with peppers and then rub your eyes with your hands. A very nasty experience. Some people say that they get an endorphin-high from eating hot peppers, finding the experience pleasurable. When used in a cream, it can relieve muscular and neurological pain for a short time. It’s even proposed that it could relieve the symptoms of shingles. Hi, I'm Roberta Wennik, a nutritionist, registered dietitian, writer, and am certified in the Myers-Briggs Type Indicator® (MBTI®). Welcome to Advantage Diets You've come to the right place to learn how your personality plays into all aspects of your life, especially when it comes to losing weight. That doesn't mean losing the pleasure of eating. Make your complicated life a thing of the past. This book honors WHO YOU ARE. Learn how to answer the powerful and empowering question, "Is it worth it?" and find what's essential in your life. 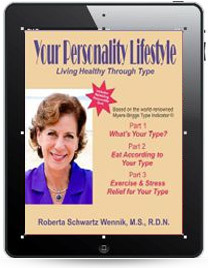 Learn about all of the 16 types, the diet plans, the exercise plans, and dealing with stress, all according to personality type. 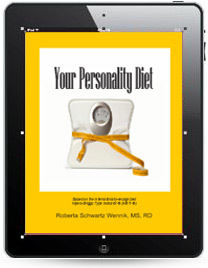 The ebook that tells you all about your personality type and the right plan for your type. 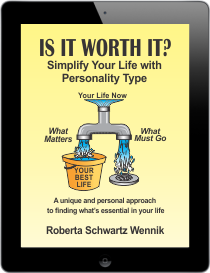 Take the FREE personality quiz and buy the book just for your type. All of our behaviors are based on the decisions we make. 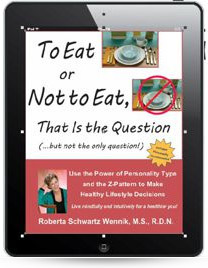 Learn how to make the healthiest decisions with your personality type and the Z-Pattern of decision-making. It’s a great way to live mindfully and intuitively. The information on this website is for informational and educational purposes only. It is not intended as a substitute for professional medical advice or the care of a physician. Do not use this information to diagnose or treat a health problem or disease. If you suspect you have a health problem, please contact your health care provider. Copyright 2019. Advantage Diets. All rights reserved. Tell me more about what you need! Need to lose weight? Solution. Looking to simplify your life? Solution . Ready to change your lifestyle habits? Solution. Not sure what you should eat? Solution .